The four pieces of this creative center give you everything you need to comfortably work in your home, office or classroom. With the onyx table, the drafting chair, the swing-arm lamp and the storage tray, everything you need will be close at hand and available to you as you work. 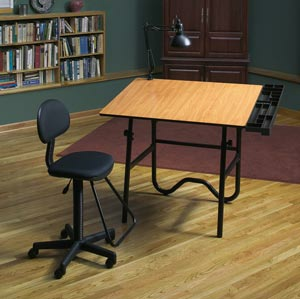 The drafting chair is sleek and elgant in its design. It has a pneumatic lift and a built-in footrest. The chair allows you to customize the height from 23" to 29". The seat has thick padding for the ultimate in comfort as you work. The Onyx table folds away for times when you want to use the space for other pursuits. Made from tubular steep with a woodgrain Melamine® tabletop, it adjusts in height from 29" to 44" and tilts from 1 to 45 degrees. The swing-arm lamp has a full 32" of reach and can be secured in any position. The four-way clamp and adjustment knobs allow you to customize the way the lamp sits on your tabletop. It requires a 100-Watt bulb. A storage tray has 15 compartments that allow you to keep mountains of tools and instruments nearby and organized for your convenience. At 31.5" long and 6" wide, you can fit countless small tools in the many compartments.